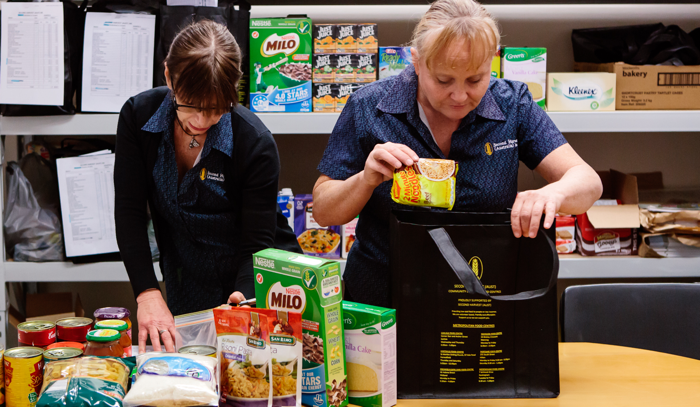 With the support of funding from LotteryWest, Second Harvest Australia Incorporated branched out into Emergency Food Relief in 2009. From small beginnings this continues to develop and support local communities. The Emergency Relief Programs have been primarily in food vouchers or hampers and are distributed following a vetting process through the Food Centres. Currently Second Harvest provides emergency relief food hampers to those in need in the Cockburn area. Additionally hospitals have been approached to assist needy families with hampers following the discharge of the patient from hospital. Second Harvest are currently supplying hampers to King Edward Memorial Hospital, Armadale Hospital & Fiona Stanley Hospital. Second Harvest would like to Thank Lotterywest, Cockburn City Council & ATCO Gas for their continuing support…. Second Harvest have received a $18,000 grant from the Cockburn City Council to go towards our Emergency Relief Program. These funds will greatly increase our ability to assist members of our community that find themselves in need of support. Second Harvest continued to partner with the fantastic ATCO staff for two more “Big Cook Ups”. After a lot of peeling, cutting, slicing, dicing, stirring and waiting for the polenta to get thick and creamy, the meals were ready to be packed into their containers, sealed and labelled. All the meals were given out in our Emergency Relief Food Hampers. The hearty vegetable curry and shepherds pies were well received by all our clients. Second Harvest is extremely grateful for their ongoing support. Thank you ATCO Gas!